Me and my mum were talked about where to go on our next trip. We thought of going to Korea since most of my skin care that I brought from last year were almost finished, time to stock up! I've always been a fan of Korean makeup and skin care products as I think K-Beauty is a worldwide phenomenon. That's the first reason why I am so obsessed with their products. Another reason is because their pricing are so much affordable compare to the other brands. 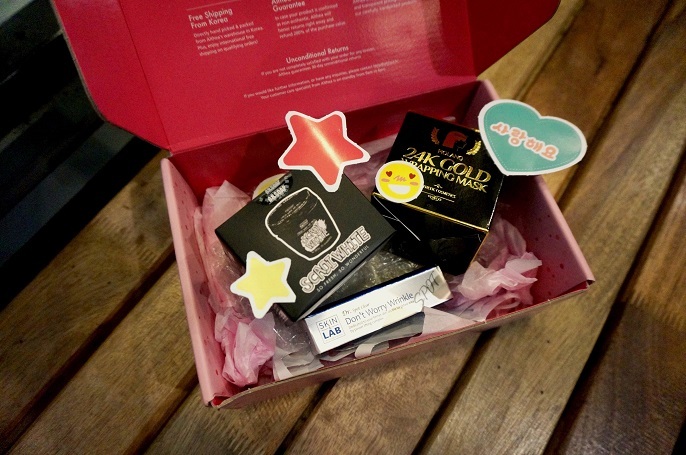 It's so great to know about a new online shopping platform which sending the beauty products all the way from Korea. All you need to do is just click away to complete your order without flying all the way to Korea! Save your flight ticket! Save your hotel rooms! Save your luggage spaces! Save your time and stress! Aren't you excited to know what website is that?! Let's continue to read! Althea is a wonderful shopping land where you can get your K-Beauty fix and have it shipped from Korea to your doorsteps! The total international transaction only takes 10-15 days, no tax no fuss, but just click, pay and ship! The website has everything from skincare to body care, also most of the Korean brands are available on the site too. I love this webstore soooo much and I think by having it I don't need to go out to step out from my house to shop! From what I calculated, the prices are quite reasonable compare to the shops in KL (KL are so expensive), plus our current exchange rate is so low now. If you are also a K-Beauty lover, I am sure you will also love Althea! And for this post, I would like to express my big Thank You to Althea for sending such lovely box to my doorstep. I am a big fans for cute or interesting or attractive packaging. This adorable pinky wrapping box just melted my heart right away. 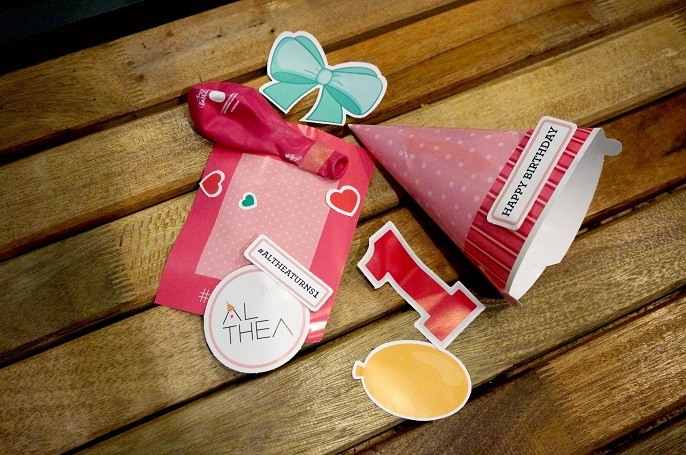 This special packaging is all about celebrating 1st birthday with Althea. 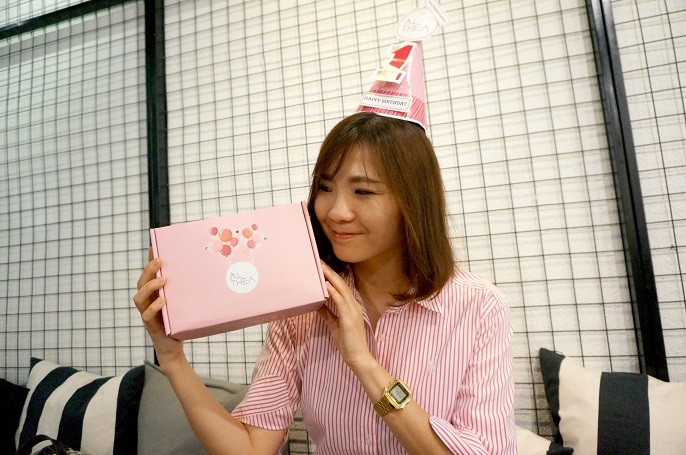 The package comes with the party kits, which includes a pink balloon, party hats, and all kind of props for decoration. It's so fun to play around the cutie kits! Everything wrapped in pink, and with a pink tissue paper some more! For my first Althea Haul, I have picked #1 Skin&Lab Don't worry Wrinkle Spot @ RM47, #2 Piolang 24K Gold Wrapping Mask @ RM69, and #3 B&Soap Scadi White Pack @ RM48. If you noticed me well, you will realize that I have smiling wrinkles on my eye areas. I have tried many different eye serums before, but they are just not effective. Hopefully Don't Worry Wrinkles Spot can help me to erase all lines easily! Have been keep my eyes open on this 24K Real Gold Wrapping Mask for long time. It has all the functions I need which include purification, transparency, dead skin removal, hydration, and improve skin tone. Whitening products is one of my skin essential. I mean who doesn't want a fair skin?! So trying out any new whitening masks is what I like to do, and hopefully the Scardi White Pack will not disappointing me! Well, that's all I have for my first Althea haul! Lastly, before I end this post, there's a good news for you! To celebrate Althea birthday, there are many promotions are going on from 20th - 31st July 2016. 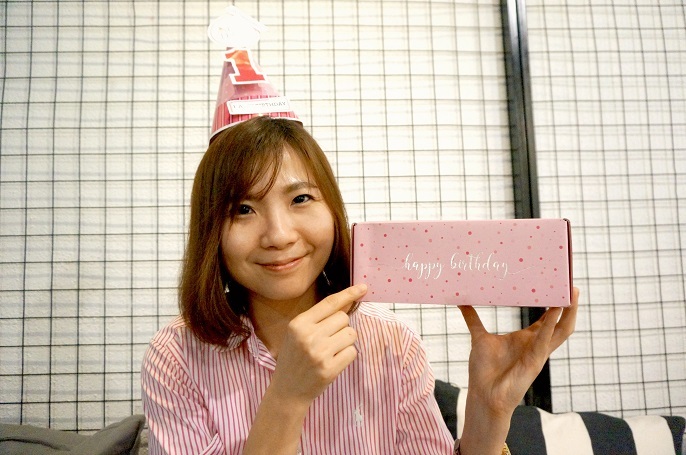 #1 Limited Edition Birthday Box with DIY Party Kit, which only available from 20 July onwards, while stocks last! #2 Free goodies for first 1,500 shoppers with full-size beauty products. 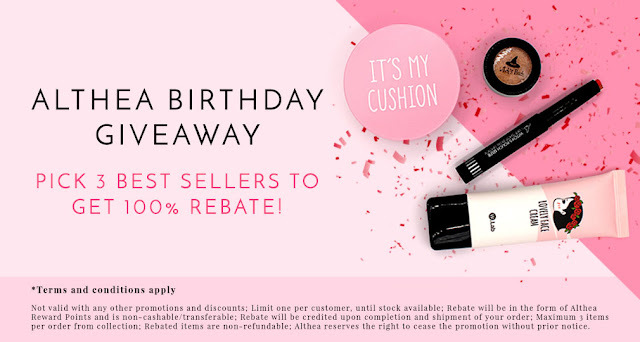 #3 Birthday Giveaway by picking 3 top sellers for 100% rebate. #4 AltheaTurns1 Instagram Contest which worth KRW10,000,000 to be won! 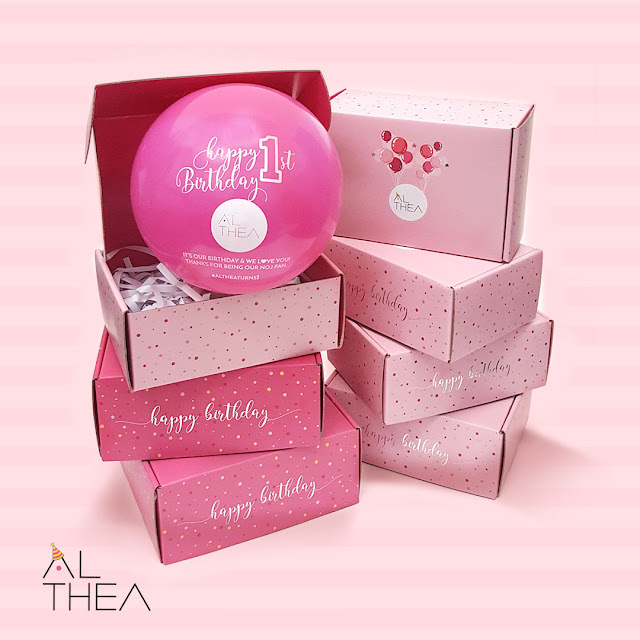 Got your Althea party kit and wish Althea a happy birthday with #altheaturns1 and stand a chance to win amazing prizes such as MacBook Air, Ipad Air 2, iPhone 6S, Galaxy S6 Edge, Canon EOS M10 Selfie Camera, Althea credits and beauty hampers from Althea. Contest starts from 20th July - 15th August 2016. Alright I shall stop now and let you do the shopping now! Keep in mind that Althea offers free shipping for shopping over RM150, and it also has a 10 days return policy. For more information, hop over to https://my.althea.kr/. Once again! 생일 축하합니다 Althea! 감사합니다 Althea! 사랑해요 Althea! Hye dear, this is Mira from Althea. We would like to thank you for joining in our online Birthday Party. We hope you had fun! Yea! I had so much fun up there with Althea.